What do you think of the new domain and name? I’ve been meaning to update the name for awhile now since this blog has shifted to being about running and all things vegan as well as raw vegan recipes. 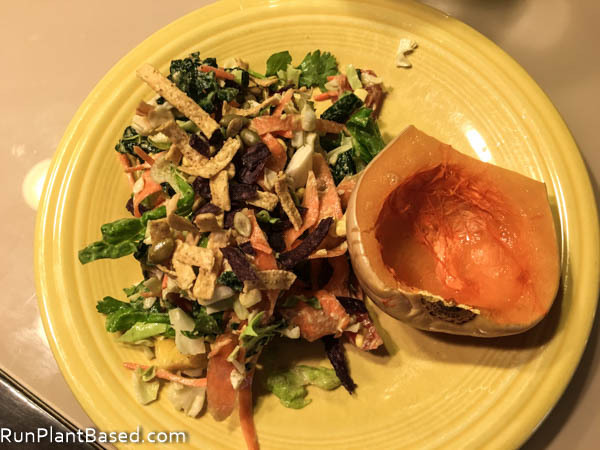 When I first started this blog over 6 years ago, I was driven to transition to a raw vegan diet after going to a demo and having my eyes opened to the possibilities. Since then I’ve fluctuated with the raw percent in my diet and became passionate about running and the compassionate and environmental sides of a vegan diet, so it was time for a change. There will still be raw vegan recipes and foods, but other whole foods vegan recipes as well as more about fitness and living the vegan lifestyle. Pardon the bumps and glitches as I switch the social accounts and everything over, it’s quite a process! I initially picked out plantbasedbalance.com for the new domain, but that name was not available for all the social media accounts and too long for others. So runplantbased.com was my second choice and it’s grown on me a lot. Therawproject.com still works and that address is not going away. And hopefully in the next couple of weeks this site will get a stylish makeover, it needs one! :-) So again, pardon the name change twice on the Facebook page and this is why I could never get a tattoo! 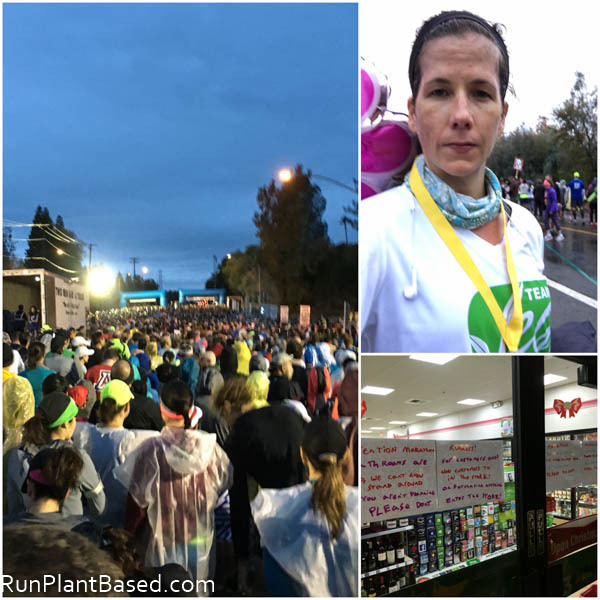 Anyways it’s been a busy weekend here with site updates, family gathering, house work, shopping, and running a leg of the California International Marathon Relay in the rain! 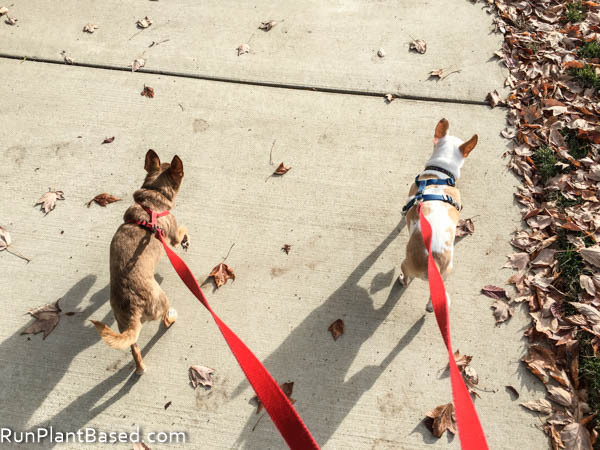 And I crammed in a long dog walk yesterday with the pups before the rain started. 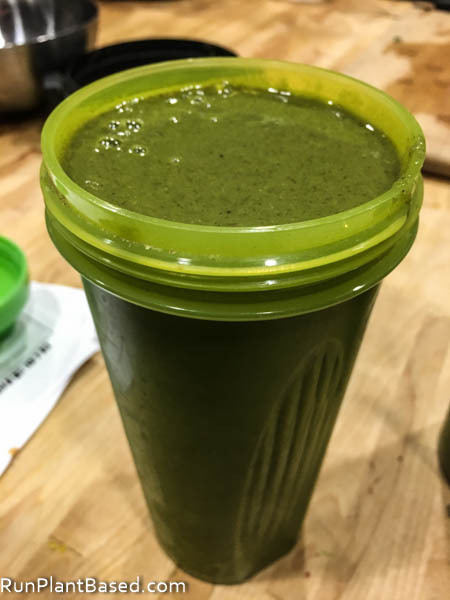 We’ve been getting aggressive with our breakfast smoothies with winter weather and stresses, this one has broccoli, hemp protein powder, chia seeds, apple, orange, banana, carrots and kale with stevia and pumpkin pie seasoning – whew! It was also good, sweet with a pumpkin pie flavor and smooth texture. There have been plenty of salads too, like this loaded romaine salad with baked butternut squash. 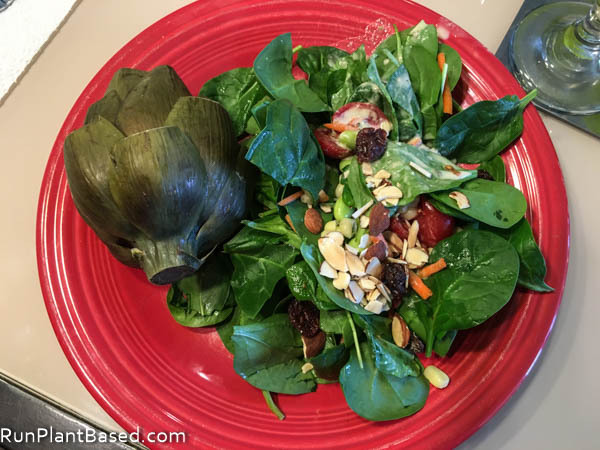 And this hefty spinach salad with steamed artichoke. 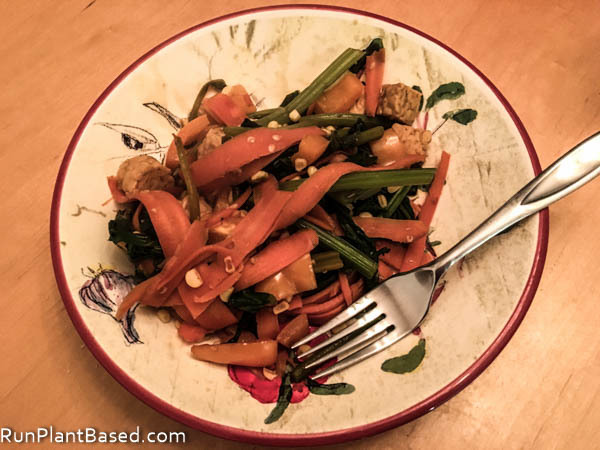 Of course oil free stir fries! This tempeh stir fry had chopped beet greens that were delicious. If you buy beets, save the greens for smoothies, salad, or stir fries! 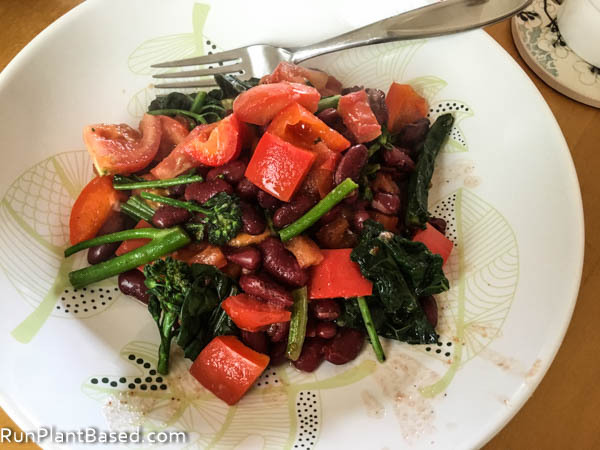 And I used organic kidney beans in this Cajun seasoned broccoli stir fry. Delicious, simple, and ready in under 15 minutes. 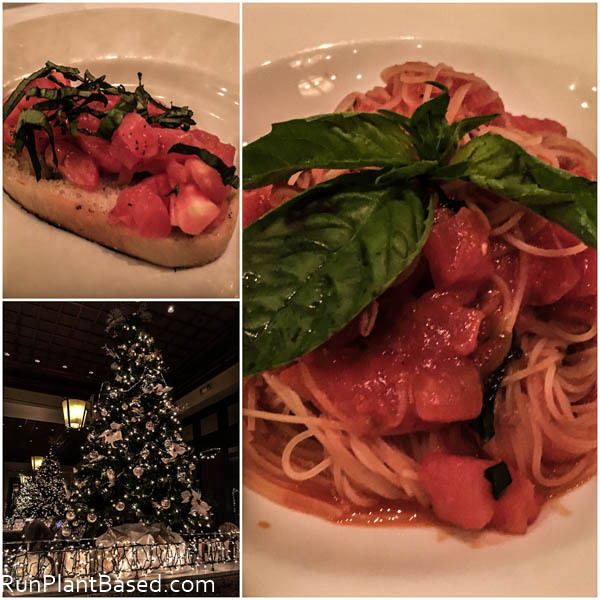 Hubby and I also stepped out to Il Fornaio for dinner and did a little Christmas shopping at the mall, I just loved their classy Christmas decorations and amazing vegan angel hair pasta. This morning was early, I got up at 4:30 AM to make it to the start of the California International Marathon on time for my leg of the relay. I got asked to do a leg for a friend’s team this week when someone had to cancel last minute. It was cold, windy, and raining pretty hard and check out the crowd just to get to the start line! But I enjoyed it because I’ve never done the first leg of the relay and it was kind of cool seeing all the different types of runners and chatting with a few in the massively long and slow outhouse lines before the start. I kept a pretty good pace of 8:45 minutes per mile which was not easy with the wind, rain, hills, and huge crowds for the first few miles. I had problems running at the pace I wanted to because the roads were so crowded. I was drenched and cold by the end, but it was worth it, a great experience since I’m still considering running the whole marathon soon. Here’s a cute list of 9 things that happen when you stop eating meat. He made an inspiring health turnaround on a plant based diet. And 15 inspirational weight loss stories through running. Also a strict inspirational vegan skateboarder. Too much TV can be bad! Even The SacBee has an article about helping climate change through diet. Top vegan cookbooks of 2015 if you’re looking for gift inspiration. Love this school going all vegan. The definition of a “manly” diet is changing and thank goodness! Get your protein through a variety of plant based foods. Good food trends to look forward to in 2016. Finally, 17 funny conversational vegan shirts if you’re still looking for your Christmas list. Whew, we’re finally going to get a Christmas tree today since the rain seems to have stopped, hope everyone is having a great Sunday! awww i loved the name ‘the raw project! Aw, thanks! I will keep the raw recipes and simple salads, I promise! :-) And include simple cooked whole foods vegan recipes too and fitness. I love the new name Christine! It’s a good change to to reflect what you’re focusing on for your blog. You always have great recipes both raw and regular vegan. Thanks! It was time for a change since it’s not 100% raw vegan anymore. I wondered if this was you when I saw your post on my blog! Congrats on the new name and domain!